Gene A Felice II: ADSR: Attack Decay Sustain Release "Creation Story"
This melds the historical roots of electronic music with the creativity of Asheville artists who have been inspired by the connections between analog synthesis and visual and performing arts. Pushing the Envelope: ADSR was a collaborative, multi-media art show that I had the pleasure of curating for the Bob Moog Foundation. The show consisted of an opening and closing event as well as several interactive workshops throughout the month. It melds the historical roots of electronic music with the creativity of Asheville artists who have been inspired by the connections between analog synthesis and visual and performing arts. Bob Moog’s pioneering work served as inspiration for the exhibit. The show was held at The Artery in Asheville’s River Arts District from Saturday, July 9th, through Saturday, July 30th 2011. The Asheville Area Arts Council and the Bob Moog Foundation co-sponsored the exhibit. I was also a participating artist, collaborating with David McConville on “Creation Story”, a cymatics driven look into the universal patterns and forces that shape creation of all forms. 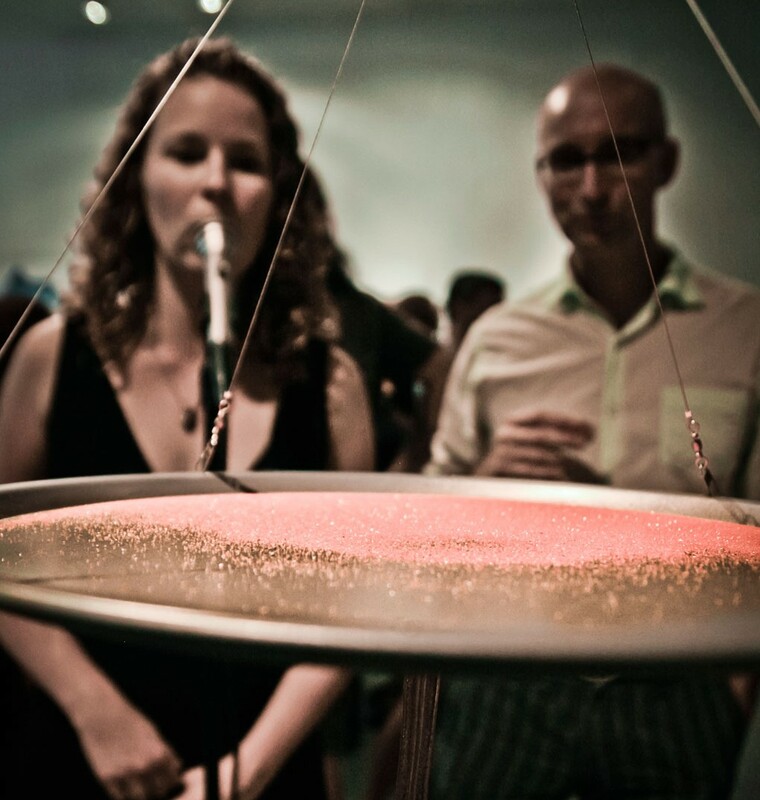 This consisted of three cymatics stations exploring the connections between sound, waves and matter. We began with a Tibetan singing bowl full of water, a truly analog source of wave patterns. When played the cymatic patterns emerged and sent vibrations though the participants arm and into their body. It was a very intimate way to explore these relationships. Another option was to sing or speak into a microphone that transformed your voice into waves passed through sand. Again patterns emerged that ranged from mandalas to mathematical visualizations. Finally, the third station transformed the electromagnetic fields of the Theremin, into waves of water, fluidly forming and reforming from one frequency to another. Throughout all of these interactions, a massive library of imagery displayed the patterns and archetypes in nature that are connected through all forms of matter & energy. The work of 12 artists surrounded a small selection of analog electronic instruments, schematics, notes, and ephemera from Bob Moog’s archives, illustrating the connection between innovation, electronic sound, and creativity in the arts. A focal point of the show, the archives illustrated both the history and the technology behind the Moog sound. This includes the envelope generator, a major component in music synthesis that controls changes in a sound’s loudness and spectral content over time. Most envelope generators control four parameters—attack, decay, sustain, and release—commonly referred to as simply ADSR. There was also a series of all-ages workshops focused on the show’s theme and on community outreach and education. Participants had opportunities to learn about electronic synthesis, sound visualization, and art in a hands-on environment. In addition, the show gave the Asheville Arts Council and the Bob Moog Foundation opportunities to highlight their respective missions and pay homage to art, music, and technology as intertwined mediums of expression that were all expressed in Bob Moog’s work.